It's not even summer yet, but the heat has been brutal with triple digit temperatures. I'm praying we don't have a repeat of last summer, which was the hottest and driest on record. One of the drawbacks of living in Austin is either it's boiling hot, or during the cool season, we are fighting horrific cedar allergies. But we love our city nonetheless! It's beautiful, the people are the best in Texas and our food scene is exploding. This heat means I need to spend as much time in the pool as possible, and less time inside the hot kitchen. Last weekend we were perusing our new Whole Foods and found a beautiful rack of Baby backs. That means it's time to grill up some Dr. Pepper Baby backs poolside with the Big Green Egg!! I think these may even be better than the ribs at Houston's/Bartletts restaurant. They have just a subtle hint of Dr. Pepper, and a great kick from the dry rub and bbq sauce. Serve with baked beans (Bush's Grillin' Beans are delish), homemade corn bread and you've got yourself a mouthwatering southern Sunday BBQ. Get a rack of baby backs, remove the membrane from the bottom of the ribs with a knife, or ask the butcher to do it for you. This will ensure your ribs will be very tender as the membrane does not break down. (We prefer Berkshire pork as they have terrific flavor BTW). In a baking dish or foil pan, pour two bottles of Dublin Dr. Pepper (Sadly, they are no longer in business, but we like that they used cane sugar and now use the HEB brand Dr. B with pure cane sugar. The plain old cane sugar kind will work too though. I'm just kind of a snob). Throw in a couple of whole garlic cloves, sprinkle the tops of the ribs with dry rub, cover with foil and refrigerate overnight or 48 hours for a good soak. I've also fallen in love with Dizzy Dust brand Pineapple dizzy dust as a rub. AMAZING!!! You will likely have plenty of rub left over to store in the pantry for future use. Great on chicken too!! On the day of grilling, fire up the Green Egg and raise the temp to about 500 degrees. Then close the bottom and leave it open just a tiny bit. 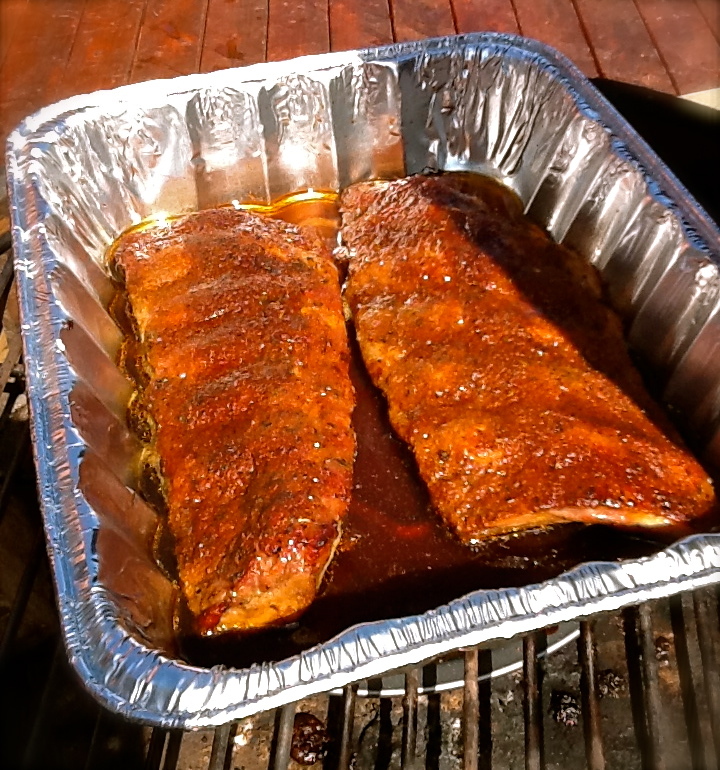 To prepare the ribs, slather with mustard and dry rub until thickly coated. Close the top vents until barely open and close the bottom vent until there is just a tiny peek open and lower the temperature to 225 degrees. We also add a big chunk of Pecan wood once the temperature is down that has been soaked for a few hours in water. We cook the ribs indirectly and have the plate placed over the coals, with the legs facing up. We place a pan of water over the plate, then cover with the grill grate. I don't use a rib rack, but simply place the ribs directly on the grill, meat side up, sprinkle liberally with more rub and smoke them for 2 hours, spritzing them each hour with DP. Then it's time to make these ribs meltingly tender. 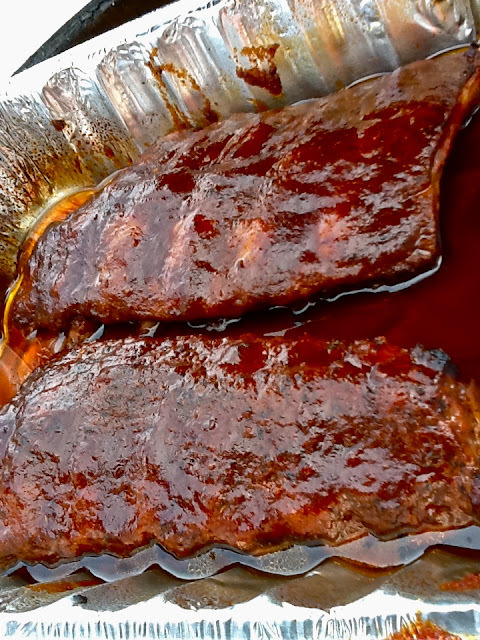 We fill a foil pan with a fresh bottle of Dr. Pepper, place the ribs meat up and baste with DP. Sprinkle a bit more rub if you'd like, cover tightly with foil and cook 3 hours more. Ribs just before covering & cooking for another 3 hours. Then after three hours are up, we baste again with DP, then paint on our favorite BBQ Sauce, and cook uncovered for one more hour, being sure to baste every 20 minutes with BBQ sauce. 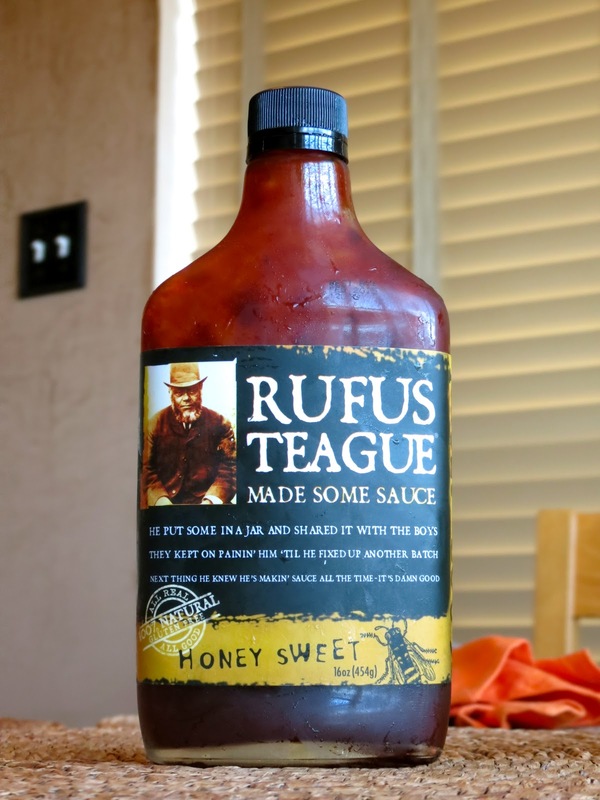 We LOVE Rufus Teague's Honey Sweet. I'm from North Texas originally, so we like our BBQ sweet, FYI. The more south you head, the more they like a vinegary style BBQ. No thanks, not for me :-) This recipe also works really well with coca cola- as long as it's made with real sugar and not the corn syrup junk. Best BBQ Sauce EVER!! Especially if you stir in a little bourbon reduction. I love how the bottle looks like a whiskey flask! These babies are ready to eat!! See how the bones are sticking out a bit? That's when you know they are perfect and fork tender. Very interesting recipe. Haven't had ribs in awhile and I sure would like to try these ones.